JNN 14 Dec 2014 Baghdad : Millions of Shiite Muslim pilgrims thronged the Iraqi shrine city of Karbala for the climax of annual Arbaeen mourning rituals on Saturday. The Iraqi government confirmed that the number of pilgrims in the city of Karbala for the annual Arbaeen (Arbain) pilgrim has reached a record 17.5 million this year. 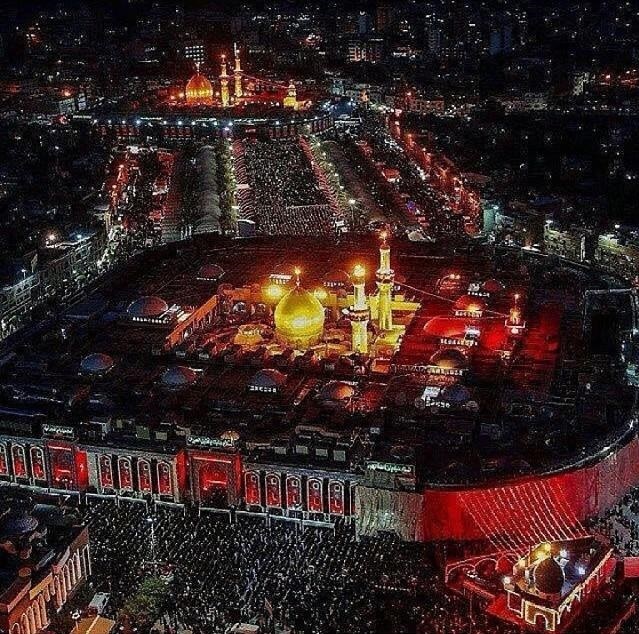 If the number is officially confirmed, the Arbaeen 2014’s number of pilgrims will only be one step behind the largest historic peaceful gathering of people in one place for a single event. The first place is occupied by the 10 February, 2013, Kumbh Mela in Allahabad, India, which saw a monstrous crowd of 30 million people on that day gathered to bathe on Mauni Amavasya. Some local sources report the number crossed 20 million on the day of Arbaeen on 13 December. Some had walked for more than 12 days, from Iraq’s far south or across the border from Iran, while others were bussed in or crammed into lorries for the journey. All made the journey despite a precarious security situation, and concerns that militants would strive to target the pilgrims. More and more Shia pilgrims from around the globe were pouring into Karbala on 13 December to commemorate the religious ceremony, which observes the 40th day after the anniversary of martyrdom of Prophet Mohammad’s grandson, Imam Hossein (AS). Pilgrims, clad in black dresses, were reportedly walking toward Karbala, where they take part in the mourning ceremonies around the shrine of Imam Hossein. Iraqi forces have already tightened security to protect people from any possible terrorist attacks. The Iraqi government has also kept measures in place to evacuate pilgrims in case of an emergency. The procession – which includes some 1.3 million members from Iran – marks Iranian Shias’ solidarity with the Iraqis as the country struggles to cope with the deadly onslaught of the notorious Sunni hardliner militant group, ISIS or ISIL. “The number of Arab and foreign pilgrims has reached 4.5 million, of 60 different nationalities, the biggest contingent being Iranians,” Iraqi Defence Minister Khaled al-Obeidi told reporters on Friday. “And until today, we had 13 million Iraqis,” he said. The Morale of the Shia Pilgrims was reaching the heights in this terrorism inflicted country , as the Pilgrims were highly motivated , inspite of the terrorist attacks . Forget mortars, even if it rains jihadists on Karbala, we will not be prevented from visiting the Imam Hussein shrine,” said Kadhem Hussein, a 25-year-old who had walked from Nasiriyah, some 300km away. Defence Minister Khaled al-Obeidi said a total of 17 million will have gone through Karbala for Arbaeen this year, including more than four million foreigners from 60 countries. According to the Iraqi authorities this is a new record, with more people visiting Iraq for Arbaeen this year than ever before. The commemoration lasts roughly a month and culminates with the arrival of worshipers at the shrine of Imam Hussein in Karbala in central Iraq. Worshipers often pray and chant , while some generous People also offer services to feast to accommodate the Pilgrims , as much as they can in all the Possible ways they can , together, with scores of tents and temporary shops and stalls opening up for the month-long build up. The municipality of Tehran has provided 60 rubbish trucks and 10,000 volunteer to help clean the tonnes of waste from the tens of thousands of meals served to the pilgrims. “This religious event is the largest gathering in the world, as the number of participants exceeds 15 million people, [which is] around one-third of Iraq’s population,” academic and former director of Al Najaf Satellite TV Channel Ali Moamen told Al-Monitor. The Best News is that No Major Incident of terrorism or sectarianism was reported from Pakistan, Iraq or other Parts of the World, except some Minor Incidents. As the Mourning Procession which were taken out with full Religious fervor across Pakistan culminated Peace fully. This entry was posted in Iraq News, Middle East and tagged Arba'een, Chehlum, Imam Hussain a.s, Iraqi government, Karbala, Pilgrims. Bookmark the permalink. Salaams.Is your URL and Website blocked. We Do come across such Problems , from different Govts , Yet as per our Investigation you are trying to access our site from Washington , US , But this would be the first complain from US , as we get thousands of Hits from US , and till yet ,we have not received any complaint from our US Subscribers from US , But if any how you could not access our site , or find any difficulty in accessing our site , then do let us know , so we ll try our best to resolve if there is any technical issue .